Krazy Krouse Kids: "Crispy Treats"
Last night the kids and I made Rice Crispy Treats. It has been a while sine we have done this, but we were inspired by pink and green marshmallows we saw in the grocery store. 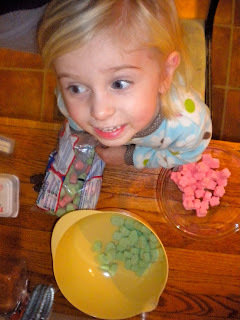 The pink marshmallows were stars and the green marshmallows were Christmas trees. Caroline sorted the colors for me as I wasn't sure what color pink and green would have made when melted together. She insisted on doing it all by herself. Tucker and I waited patiently for her to finish as we were informed that "only big girls can do this." Caroline then decorated the "crispy treats" with Christmas sprinkles and viola! Our next project will be gingerbread men. I have a feeling we may wait until Tucker is in bed to attempt that. He is not quite as patient as one needs to be and wants to eat the treats right away. Lucky for him, rice crispy treats are ready immediately.